There are great aspirations being made in the direction away from tangible and towards digital money. But can this be done in a simple and secure way, while still keeping the tangibility and transparency of paper money? Most people already have their savings and transactional or credit account in digital form. The only thing that is still physical is cash money. It’s the smaller amounts that people spend on a daily basis. At the point-of-sale, cash is still the fastest payment method. Other methods are slower because they require security authentication. This makes those payment methods more susceptible to exploitation, since account details are shared at every payment occasion. Cash is different, because it accesses account information only once, this makes ATMs the weak spot. Besides this, online banking authentication is also a problem in dire need for a solution. So far, there hasn’t been an elegant solution to any of those problems, a solution that wouldn’t sacrifice convenience for security. The goal was to envision a future where people don’t have to worry about the protection of their financial assets anymore. Everyone deserves to have a safe way to handle the money that they have earned through hard work. Since the brief for this banking project was very open, a lot of research and many interviews were needed to find design opportunities. Many people have trust and security issues when it comes to banking -especially online banking- and finances in general. Security systems currently in place are very cumbersome to use on a daily basis and not very secure. People are also afraid when they use ATMs, because of increased card skimmings. Most people use their money in three different forms: savings account, transactional or checking account and cash. The first two are already digitalized, and it’s the aspiration of many governments to make paper money a thing of the past. Observing people at the point-of-sale and while handling cash also gave many insights. One of them is a persistent problem when giving someone an exact amount of money, since cash comes in predefined values. Whatever this project would turn out to be, it would have to require less care than a wallet and be as simple to use as paper money is today. Most people are not gadget freaks, this means that the new payment method should be as much of a fashion statement as a wallet. The potential impact of this project is enormous, especially in countries with higher crime rates. It’s liberating to carry your payment method around, without worries of it being forgotten, lost or stolen. 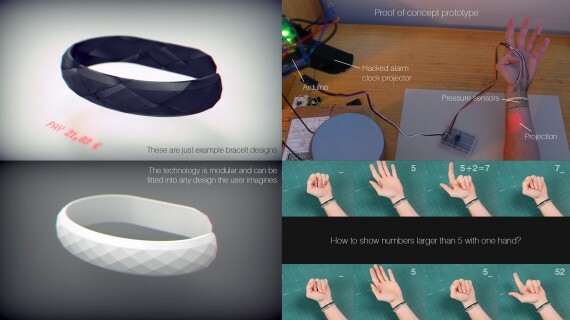 This concept takes the form of a bracelet, so it can be always with you. But one size does not fit all. The compact technology allows the bracelet to be 3D printed to perfectly fit any individual’s wrist and lifestyle, adding another layer of security, since thieves can’t differentiate between a payment bracelet and an ordinary one. All the technology is already available, at a low cost. Which gives equal opportunities for those in the developed and the developing world. It doesn’t require more care than an ordinary wallet. It’s extremely low power, doesn’t need charging and harnesses power from the body heat or motion. It also enables digital cash transactions, without the need for connectivity. There is no need to learn about how to use it and no PIN to remember. 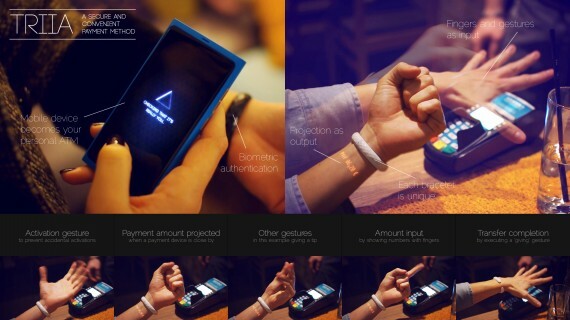 It also enables you to see at a glance the exact amount in your “digital wallet”. But most importantly, your mobile phone now becomes a personal ATM and can be used in a safe environment. Interactions at the point-of-sale were observed to figure out the right gestures for the transfer conformation. At a store the required amount is always provided before the transaction, but to transfer between users, one of them has to put in a value. The best way to do this is by showing the desired number with the fingers. While doing this, the tendons on the forearm are also moving. Three pressure sensors were used to read this in the prototype -which actually worked-, but it could also be done by measuring electrical activity in the muscles. A projector was used instead of a small screen, because it doesn’t affect the form factor and uses less energy. For that purpose an alarm clock projector was hacked and reverse-engineered. The safest biometrics currently available are vein patterns, which are 100 times more unique than finger prints and are much harder to forge – to a point where it’s not worth it. Vein patterns on the wrist can easily be scanned with infrared light. The project went as far as to define how the encryption and identification algorithms would work, what kind of data gets transmitted and what never leaves the bracelet.